I used to fish in the River Thames as a boy, catching perch and roach mainly. In Cape Town I was invited a couple of times for a days fishing with my colleague, Larry Hutchings, a very accomplished fisherman. If a fish didn’t bite within 15 minutes he’d move on – totally different from sitting for hours watching for something to happen. I also have caught snoek and mackerel from boats on spinners – very exciting when they get into a feeding frenzy. 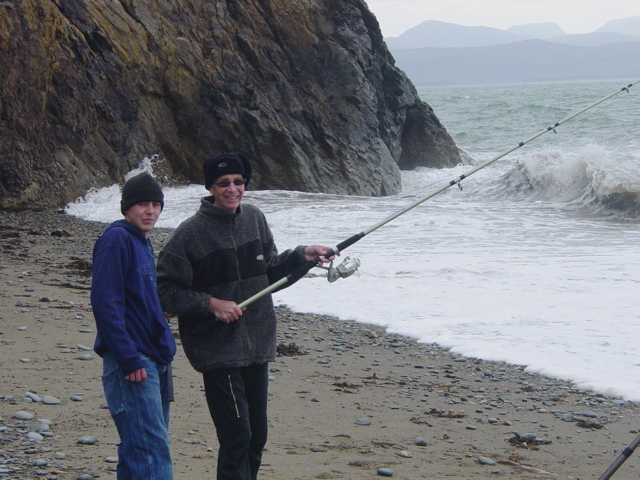 My daughter, Nicola’s partner Shaun, is a very keen fisherman and now works in a fishing tackle shop and he and I have talked at length about fishing – something we both were interested in. They’ve been to stay this weekend and I was hoping they might lend me a rod so I could try it out again. Instead they arrived with a new rod, reel, all the ancillary bits and bobs required to get me going and Shaun’s rod and tackle. Very generous of them. So both mornings of this weekend I’ve been seeing whether I still enjoy what I enjoyed in my boyhood. The sea was rough on Saturday and we spent most of the morning removing seaweed from our lines. Today was much calmer. Both days we caught fish, a weaver each on Saturday and a dogfish each on Sunday. Hopefully I’ll manage something edible soon.